This elf garment is a body slip, making this adorable and affordable! Get two-for-one with this ingenious item! This incredibly adorable outfit is also the body slip. The cuffs and collar creatively cover the cable ties used to attach the limbs to the body/outfit. It’s like getting the clothes for free! 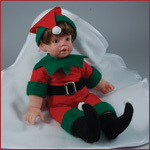 Sparingly use polyfil and weighting beads to easily position the baby so you can create an adorable holiday elf that can sit in a tree or rest among a small wreath as a cute centerpiece in your kitchen. 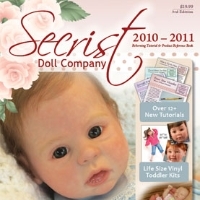 Use the internal wash in the head and limbs to create an incredible lifelike glow that makes your little baby elf look so real he might just start to giggle. You can hand root the mohair yourself, or if you would like to save some time, use our Johnny wig which is perfectly sized for the little elves – a hard size to find indeed. 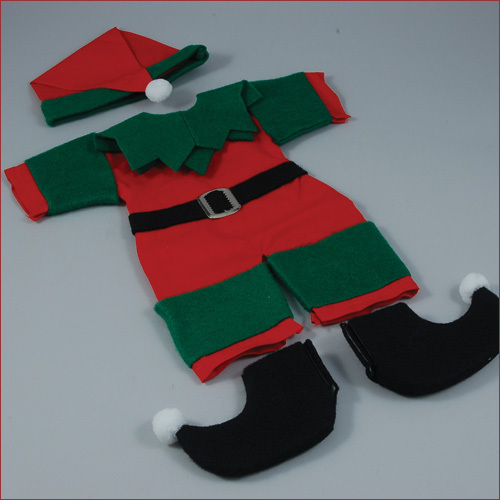 These are a very limited edition of two-in-one body slip/elf outfits so don’t delay. Come the holidays they may be all gone!